On this 2 day trip you will be exploring the beautiful Zao area and visiting the cute fox village. The tour will start in Tokyo, where you will meet your guide in Tokyo station and from there travel together to the Yamagata Prefecture. You will be exploring Mount Zao and along the way see the Jizo statue, and at the top see the beautiful Okama crater. You will also be visiting the fox village, where you can go and see Japanese foxes. For this tour there will be accommodations included, where you will be staying at the Zao Astraea Hotel, where here you can enjoy an Onsen (Japanese hot springs) to relax from your exciting adventurous day. In this tour, you can explore hidden region, Tohoku, on your own pace. Accommodation in Zao area and vehicle transfer at local area on day 2 is included in this package. Recently, the number of tourist to Japan is getting increase and major cities such as Tokyo and Kyoto are super crowded and you will be many tourist everywhere now. If you feel more private atmosphere in Japan, take this trip. You can see those exclusive sightseeing spot in Tohoku. After taking the ropeway and arriving at the Zao Jizosancho Station about 100m from the station you will see the Jizo Statue. Sitting on a 1660m highland enshrine here is a Jizo Statue that was built in 1775. It took about 37 years however after it was built strangely enough the number of accidents on the mountain had decreased, naming this statue "Disaster Prevention Jizo." Even today it is said that if you pray to the statue your wish will come true, especially prayers that have to do with disasters prevention seems to really come true. 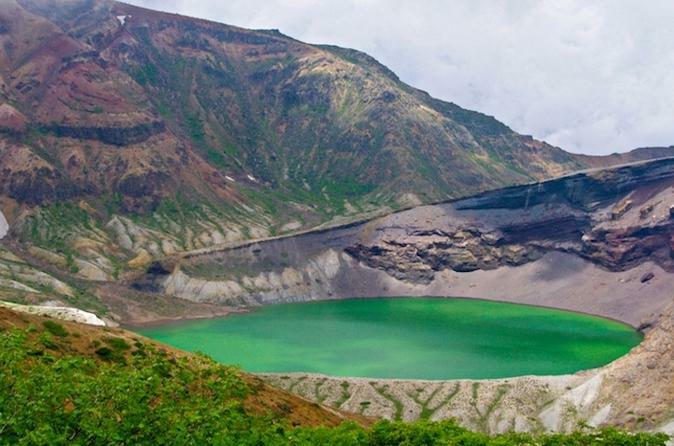 Located on an active volcano, Mount Zao, features a beautiful crater with a lake, known as okama due to it looking like a cooking pot. The crater lake is 27 meters deep and has a circumference of 1,000 meters. This lake is famous for its water's color changing due to the high acidity of the water with the intensity of the daylight. In the mountains near Shiroishi, there a "village" that is filled with adorable foxes. The Fox Village is just as the name apply is an area where you can go and see Japanese foxes. You can feed them and also there are options where you can hug a baby fox here as well. You get to go inside an open area where you can see the foxes run around. Located in the highest point of Zao Onsen above 950m seal level, making it the best place in the area to enjoy the beautiful scenery of Zao. The hotel also have a public bath and an outdoor bath with water flowing from the Zao Onsen source. You can enjoy a relaxing bath with the spetacular view of the Asahi Mountain Range. This tour does not include tour guide and assistant, so we will send you detailed itinerary information sheet with train ticket, mentioned in "Inclusion" after the booking. Please follow to the information and explore Tohoku on your own pace.